The word Hospice is often associated with the idea of giving up hope. The negative connotation with the word “Hospice” can often overshadow the wonderful benefits it provides to both patients and families. Hospice provides a specialized quality of care that allows families to experience more meaningful moments together despite a terminal diagnosis. In order to make an informed decision about hospice and the benefits, it’s important to have an informed understanding of what it is and isn’t. Here are some common misconceptions and myths about hospice care. 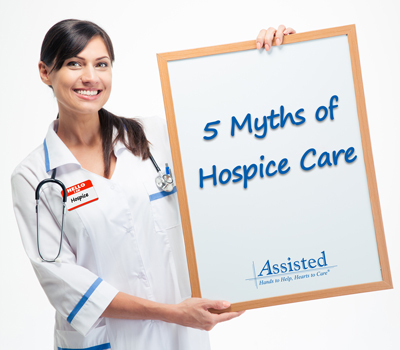 Myth 1:	Hospice Care only takes place in a dedicated Facility. Fact:	Hospice is a type of care which generally takes place in the comfort of the patients own home, but can be provided anywhere the person lives. Whether that is the patient’s own home, a residential care facility, assisted living facility or nursing home. Myth 2:	Hospice is just for the patient and ends upon passing. Fact: Hospice focuses on comfort, emotional support, and dignity for not only the patient but for the family as well. It offers support to family members while their loved one is ill but also offers bereavement counseling at no cost for up to a year after their loved one has passed. Myth 3: Giving up medical treatments. Fact: The care you receive does not mean giving up medical treatment. Hospice nurses and physicians will tailor treatments to emphasize on easing the pain to increase the quality of life. Patients are not giving up but shifting focus to living and building wonderful memories with family and loved ones. Myth 4: A patient must be on Medicare/Medicaid to receive hospice care. Fact:	While coverage for Hospice is available to most seniors through Medicare and Medicaid, it’s also covered by most insurance plans. For members of the community who are uninsured or underserved, Assisted Home Health & Hospice Foundation is available to offer financial assistance to qualifying patients. Myth 5: A patient no longer use their primary care physician. Fact: A patient may keep their primary care physician who will become an important part of the Hospice team. The patient’s doctor will work closely with the Hospice team to develop the plan of care. To learn more about Assisted and our Hospice Care services, please call 800-949-6555 or visit us at www.assisted1.com.